Villa Elya has one bedroom with twin beds or a king-sized double. There is a sofabed that makes a double or two singles in the living room. There is one bathroom with shower over the bath. Villa Seeka has one bedroom with twin beds or king-sized double. There is one shower room. Villa Dafni has one bedroom with double bed. There is one shower room. All villas full can accommodate up to 8 people. A complimentary welcome meal is provided on the evening of arrival, giving you the chance to meet fellow guests and get relaxed and settled in without having to shop or go out. There is also a complimentary breakfast pack provided in your villa. Your hostess, Quee, also offers very popular social meals of a Greek meze or a curry night. The villas are fully equipped for self-catering and there are plenty of good shops nearby, the nearest around 4 km away. There is a large swimming pool, petanque court, an honesty bar and barbecue facilities. Quee also provides relaxing and pampering massages. Fig Leaf Villas is a small naturist retreat with high class accommodation and a pool shared by the three villas. 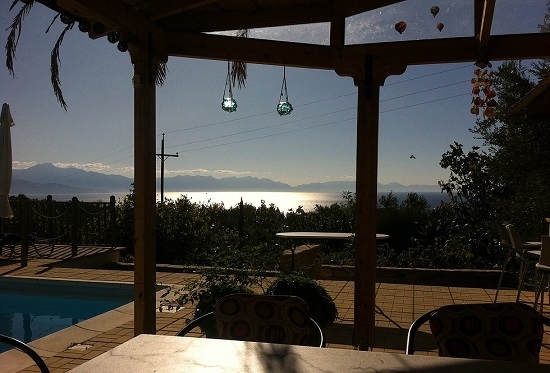 The views are wonderful and the place is set amongst olive groves on a hillside facing the sea and the mountains beyond. 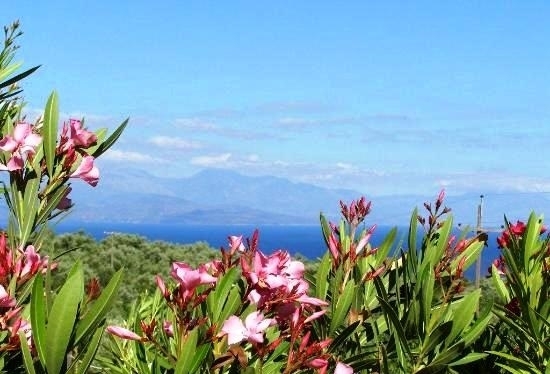 The Peloponnese peninsula is a beautiful, lush and unspoiled area of southern Greece, with many wonderful and varied naturist-friendly beaches, pretty fishing villages, waterfalls, lakes, castles and ancient sites. The villas are extremely well equipped, and guests are provided with a breakfast pack for the morning after their arrival. Also provided as standard are salt and pepper, herbs, organic olive oil (from the villas’ own gardens), washing-up equipment, hair dryers, towels, bedding, iron and ironing board.